Contributed by Alan Monk, Airframe Service Sales Rep.
API winglets only recently became available for Falcon 900 aircraft. Since Falcon 900 winglets became available this past fall, we’ve had good installation activity for the modification in our shops. We’ve done a few at our full-service facility in Lincoln, NE (LNK) and our second in Battle Creek, MI (BTL) is nearly done. There’s not a lot of difference between the winglets for Falcon 900 and 2000 aircraft, and we have a lot of experience with the 2000s. Although some additional interior access is required to run wiring in the 900s, the winglet kits themselves are fairly similar. There are a few aileron modifications, but otherwise the hardware is essentially the same. Falcon 900 winglets can easily be installed during a C inspection without any impact to the maintenance schedule. Since the interior has to be removed for the airframe inspection, it makes the wire runs more accessible for the winglet installation, which helps customers cut costs. It’s also a good opportunity for a dry bay modification, interior refurbishment and avionics upgrades like Wi-Fi or cabin entertainment systems; although more involved projects may impact the maintenance schedule. Duncan Aviation is the most experienced blended winglets installer for business aircraft. 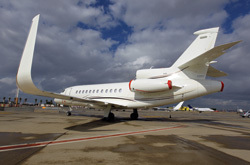 We have performed nearly all of the modifications for the Falcon 2000 fleet, and are experienced in installations for Hawker 800 series and Falcon 900 series aircraft. Please contact a member of Duncan Aviation’s airframe service sales team for more information. Alan Monk serves as an Airframe Service Sales Rep. for Duncan Aviation in Battle Creek, MI (BTL), specializing in Falcon and Hawker aircraft. His career in aviation began in 1984.